No one likes meetings and for good reason. In most meetings, most of the time, most people think most of what goes on is a waste of time. So what if you took out all of the stupid, wasteful stuff and left only the useful parts? 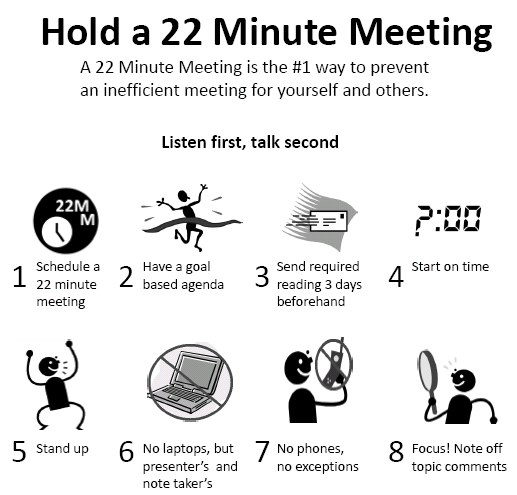 Enter the 22 minute meeting. This is an idea from Nicole Steinbok, and she presented the idea at Seattle Ignite 9. When I saw her present this concept at Microsoft a few months ago, she gave one of the best short talks I’ve ever seen. Meetings get a bad rap in business today and for good reason—very little gets accomplished in them. I can recall a Dilbert cartoon in which several people sat around a table while the meeting organizer said, “There is no specific agenda for this meeting. As usual, we’ll just make unrelated emotional statements about things which bother us…” That pretty much sums it up. The majority of meetings are unstructured, uninspiring, and unproductive. But they don’t have to be that way.